Poisonous2pets - this book is vital to anyone who owns a cat or dog. 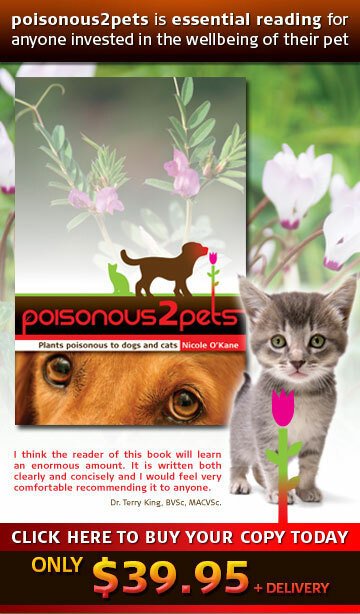 The author of poisonous2pets, Nicole O'Kane, has experienced first hand the anxiety of nursing a sick pet due to poisoning. In trying to locate the specific plants causing the problem, Nicole began a research project which has now become an essential reference for all pet owners, pet health providers and horticulturalists. poisonous2pets is a full colour book which allows rapid access to visual and written information about plants which are poisonous to dogs and cats. It enables owners to identify the dangerous plant and know what to do if their pet is poisoned. The book outlines potential toxicity to pets by categorising the plants into four levels with each toxic level identified by colours found on the edge of each page. However, prevention is better than cure and the information in this book also helps pet owners and garden designers "poison proof" the home and garden.